Only four home games are set for this weekend in DeKalb County highlighted by the Class 3A No. 2 ranked Cedar Grove Saints hosting the Towers Titans for homecoming at Godfrey Stadium with kickoff set for 7:30 pm. The Saints (5-1, 2-0) own a 16-3-1 advantage in the series with the Titans (0-6, 0-2) including wins in the past eight meetings since a 23-20 win by the Titans in 2009. The two teams first met in 1980 and battled to the lone tie (0-0) in the series The Saints have shutout the Titans 34-0 and 28-0 the past two seasons and have not allowed more than eight points in any of the past six meetings. Cedar Grove is coming off a 52-0 Region 5-3A over Redan last Friday night at Godfrey Stadium as the Saints improved to 2-0 in the region to remain tied atop the standings with Pace Academy. The victory improved Coach Jimmy Smith’s six year record at Cedar Grove to 58-14-1 and made him the school’s all-time winningest coach surpassing Ozzie Harrell (57-4-0, 1992-2000). The Saints also moved within five wins of 300 (295-193-4) as a program in their 47th season as Austin Smith threw for four of the five passing touchdowns and Robert Jones III rushed for 153 yards and a touchdown. Dante Walker, Darron Sims and Rashad Jordan all had tackles for safeties and while Walker finished with 7 tackles, 1.5 sacks and 3.5 tackles for a loss. Towers is coming off a 45-8 road loss to Region 5-3A opponent Lovett (2-4, 1-1) last Friday night. In other Region 5-3A action on Friday, Stone Mountain (0-5, 0-2) has homecoming as the Pirates host Lovett (2-4, 1-1) at Avondale Stadium in a 7:30 pm game. 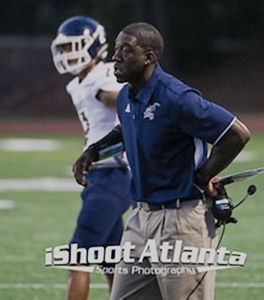 Stone Mountain is coming off a 61-18 loss to Pace Academy last weekend while Lovett defeated Towers 45-8. The No. 7 ranked Tucker Tigers moved up two spots in the Class 6A rankings and play one of the four home games this weekend as they play host to Morrow Mustangs in a Region 4-6A clash at North DeKalb Stadium on Friday night at 7:30 pm. It is the first ever meeting between the two teams as they play in region action for the first time. Tucker is coming off a 34-18 homecoming win over Lovejoy last Friday night at Adams Stadium to take sole possession of first place. The Tigers got 167 yards rushing and a touchdown from Tyler Hughey and 162 yards passing and a touchdown passing and rushing from Travon Ford in the win as the Tigers racked up 457 yards of offense. Tucker (4-2, 4-0) is historically one of the top programs in the state with a 543-222-14 record (70.6 win percentage) and Head Coach Bryan Lamar is No. 2 on the wins list at 71-17-0 in his seventh season at Tucker. He is just six wins behind Terry Hodges (77-22-0, 1957-65) who tops the coaching wins list at Tucker. Franklin Stephens went 64-6-0 at Tucker in five seasons winning the programs two state titles in 2008 (14-1) and 2011 (15-0). Morrow (1-5, 1-3) is coming off an open date and has dropped four decisions in a row since a win over Forest Park. The Mustangs and Head Coach Jerome Weeks went 5-5 a year ago for their first non-losing season since 1998 (10-2-0). Morrow won a state title in 1987 under Bud Theodocion (83-40-1) who coached 11 seasons (1977-1987). Stephenson (4-1, 3-0) heads to Tara Stadium on Friday for a 7:30 pm game against winless Forest Park (0-5) as they work towards going 4-0 in Region 4-6A action. 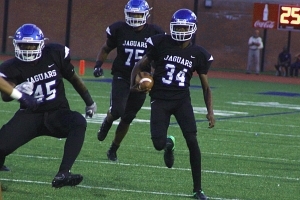 The Jaguars are coming off a 29-12 region victory over rival Martin Luther King Jr. last Friday. The Lions (1-4, 1-2) try to recoup from their loss to the Jaguars with a trip to Twelve Oaks Stadium to take on Lovejoy (3-3, 3-1) at 7:30 pm. The only other game in DeKalb has the Lakeside Vikings (1-5, 0-2) hosting the No. 3 ranked Parkview Panthers (5-0, 2-0) at Adams Stadium with kickoff set for 7:30 pm on Friday. Lakeside has dropped its first two Region 7-7A contests and is coming off a 59-7 loss at Central Gwinnett last week. Parkview is coming off a 28-0 win over Norcross last week.